April 12, 2019 – Dayco, one of the world’s leading manufacturers of engine products and drive systems for the automotive, industrial and aftermarket industries, has formed a marketing alliance with leading Pro-Am driver Roger Lago for the 2019 Porsche Carrera Cup Championship. Lago, a highly experienced Australian Carrera Cup and GT racing driver, has competed at the top end of the Pro-Am category for several seasons and is a former Porsche GT3 Cup Challenge Champion. He raced to 5th in the 2018 Tag Heuer Pro-Am Championship and is currently third in the 2019 Pro-Am standings with five rounds remaining. Dayco has previously enjoyed success with the Brisbane based driver both in local and international GT racing and during Lago’s past Carrera Cup seasons as an associate sponsor. 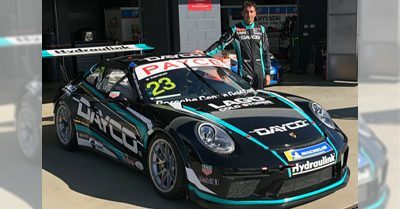 The 2019 season finds Lago’s Porsche 911 GT3 emblazoned with the Dayco logo in a bold new gloss black livery that is sure to make a major impact with its racing debut at Victoria’s Phillip Island Grand Prix Circuit for the third round of the national championship from April 12 to 14. This addition to Dayco’s Australasian motorsport program now finds the premium quality automotive aftermarket brand promoted in Supercars with Cameron Waters in his Monster Racing Tickford Mustang, in the Blancpain World Challenge Asia GT Series with Dayco Ambassador David Russell and the HubAuto Corsa Ferrari team and again with Russell in selected Australian GT Endurance Championship races and Supercar endurance races this season. This forms an exciting and comprehensive Australian and Asia Pacific high exposure marketing platform for the Dayco brand. “We are delighted to have Roger Lago race with Dayco in the world’s fastest one make series this season,” stated Arnold Mouw, Vice President, Dayco Asia Pacific. “We have known Roger and his team through our brand ambassador David Russell for several years now, so when the opportunity came for us to become a part of his team, we were excited to be involved in such a prestigious and dynamic racing category. As a leading European aftermarket component manufacturer and as OE component suppliers to Porsche, this alliance makes a lot of marketing sense. “The livery looks incredible and we are sure that our trade customers will enjoy the close Carrera Cup racing both at the high profile Supercar events and on television,” Mr. Mouw added. The 2019 Porsche Carrera Cup Australia rounds are all held in conjunction with Supercar events with all races broadcast live on Foxsports. The remaining 2019 rounds include Phillip Island April 12-24, Darwin June 14-16, Townsville July 5-7, The Bend Aug 23-25, the Bathurst 1000 Oct 10-13 and the Gold Coast 600 Oct 25-27.